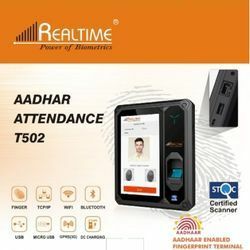 Pioneers in the industry, we offer realtime t502 aadhaar enabled biometric fingerprint machine, realtime t502 aadhaar aebas with lan wif gprs, aadhaar enabled (android based) fingerprint reader, realtime t502 aadhar enabled biometrics attendance systems and aadhaar approved & stqc certified biometric attendance from India. 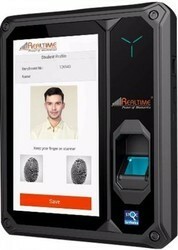 This innovative Biometric clock will dramatically improve your ability to monitor your workforce movements during their working patterns and with features that gives you better time and management reporting. The Realtime TAB is suitable for both basic to moderately complex time and attendance requirements. The 7" Touch screen offers a wide range of possibilities, starting from the classical Time recording App to a complex Factory Data Collection App or a high-security solution with access queries supported by a comparison of live images with stored images or audio-visual communication to a Service Command Centre, e.g. for Data centres. Everything is possible. Haryana School Development & etc. Govt. School Development & etc. * STQC/ Aadhaar approved fingerprint Sensor. * ANSI Compatible Fingerprint Templates and Images. * ISO Compatible Fingerprint Templates and Image. * CE, FCC, IEC60950,RoHS Certified fingerprint Sensor. * Capacitive 7" Touchscreen of 800x400 Pixels. * 1.2GHz Dual Core Processor. * Dual SIM Card Support.